The Speak & Read series help your child to recognise more than 500 words effectively by deploying proven flashcard-based techniques pioneered in USA and Japan. 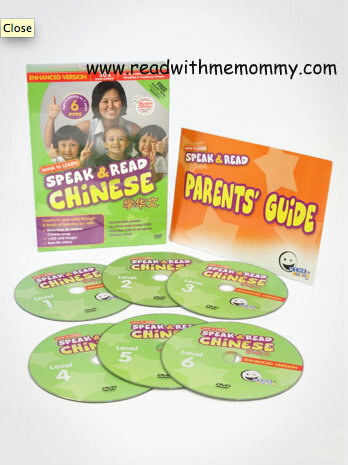 Speak & Read Chinese 6-DVDs is your child's best tool in learning Chinese. It contains separate lessons for Simplified and Traditional Chinese. Every Speak & Read DVD purchase comes along with a free Parents' Usage Guidebook. This guidebook contains instructions on using the DVDs. This flashcard-based DVD series is inspired by the flashcard principles of Dr. Glenn Doman. To help your child in learning Chinese, the program breaks down the various radicals/segments in each Chinese word using bright colours. This helps your child to recognise the words 25% faster compared to any other programs in the market place. Besides, each lesson duration is designed to be short (less than 5 mins). Every lesson is followed by a cheery children Chinese song or fun music to captivate your child's attention. Check out our testimonials from Brillkids and Todaysmotherhood. DOWNLOAD: Parents' Guide as well as the Contents of these DVD programs. WINKtoLEARN Pte Ltd, one of the largest early learning resource developers based in Singapore, provides one of the most comprehensive range of language learning children DVDs helping your child to acquire multiple languages from young. Our programs are inspired by proven teaching methods pioneered by Dr. Glenn Doman (from USA) and Dr. Makato Shichida (from Japan). WINKtoLEARN is also the 2011 winner in educational DVD category in the Mother & Baby 2011 Awards contest. These programs are excellent resources for parents and educators to give children an early headstart in their lives. Early learning is critical for every child's growing journey. Flashcard methodology is proven to be highly effective in helping even babies to read from young. Early exposure to learning proven to help an infant's right-brain developmentand right-brain development. Our Speak & Read series provides a systematic curriculum-based program to parents and educators which help children to acquire words, phrases and sentences. The biggest advantage is that your child only needs to learn one lesson a day over a period of six months. This means that your child will only be exposed to TV less than eight minutes a day which sets our programs apart from any other programs in the marketplace.